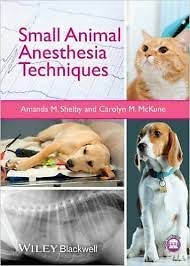 Small Animal Anesthesia Techniques provides a quick reference to protocols for anesthetizing canine, feline, and exotic animal patients in veterinary practice. This portable companion provides complete information on anesthetic procedures, from the basics of pharmacology, physiology, and equipment to handling challenging procedures and the compromised patient. A companion website features videos, images, and worksheets for calculations. The book offers an overview of the anesthetic process, with tips on how to anticipate and avoid complications, and with example protocols for specific patients. Veterinarians and veterinary technicians will find this how-to guide to providing anesthesia to be an ideal resource for fast access to drug dosages, anesthesia protocols, and special considerations for specific procedures. Includes access to a companion website offering videos, images, and worksheets for calculations at www.wiley.com/go/shelbyanesthesia.